STAT3, a member of the signal transducers and activators of transcription (STAT) family, has been shown to play a key role in promoting proliferation, differentiation, or cell cycle progression, depending on cell type. A number of signaling pathways are altered in laryngeal papillomas, benign tumors induced by human papillomavirus 6/11. Papillomas overexpress the epidermal growth factor receptor and display enhanced MAP kinase and PI-3-kinase activity. They also show reduced activation of Akt and reduced levels of tyrosine-phosphorylated STAT3, due to overexpression of the tumor suppressor, PTEN. As papillomas show abnormalities in terminal differentiation, we examined the potential role of STAT3 in regulating epithelial differentiation. Laryngeal epithelial cells were suspended in supplemented serum-free medium. Differentiation was measured by Western blot analysis of keratin 13. Normal laryngeal epithelial cells were transfected with a constitutively active STAT3 or a dominant negative STAT3. Cells were transferred to suspension culture 24 h after transfection. Increased expression of keratin 13 was accompanied by the activation of STAT3 when differentiation was induced, and expression of a constitutively active STAT3 (STAT3C) enhanced the expression of keratin 13. In contrast, expression of a dominant negative STAT3 (Y705F) inhibited the expression of keratin 13. We conclude that activation of STAT3 is required for the differentiation of normal human stratified squamous epithelium. Laryngeal papillomas are benign squamous epithelial tumors caused by infection of the low-risk Human Papillomavirus (HPV) type 6 or 11 (1). They are characterized by a hyperplastic supra-basal epithelium surrounding cords of connective tissues (2). The process of epithelial differentiation is complex, involving the coordinated step-wise change in expression of multiple genes. Papillomas display abnormal differentiation, as indicated by a drastic reduction of keratin 13, a mucosal epithelial differentiation marker (3). Basal cells of all stratified squamous epithelia display a keratin network composed of the type II keratin, K5, and the type I keratin, K14 (4,5). Other keratin pairs, such as K4 and K13, are expressed in suprabasal-stratified squamous epithelia (6). These are markers of early differentiation. In both skin and mucosa, the outer layers of terminally differentiated cells are replenished by the basal proliferating keratinocytes. Basal cells proliferate and either retain the stem cell characteristics or migrate outwards and differentiate. This dynamic transition is accompanied by drastic alterations in gene expression programming (7). Signal transduction in HPV-infected papilloma cells is altered. They express elevated levels of the epidermal growth factor receptor (EGFR) (8,9), which lead to constitutively activated MAP kinase and enhanced PI3 kinase activity. Papillomas show reduced activation of protein kinase B (PKB or Akt) (10) and reduced levels of phosphorylated STAT3 due to overexpression of the tumor suppressor, PTEN (11). Negative regulation of STAT3 by PTEN immediately implies a role of STAT3, a transcription factor implicated in the differentiation of a variety of hematopoietic cells (12, 13, 14), in mediating the abnormal differentiation of HPV-infected papilloma tissues. STAT3 is a member of the signal transducer and activator of transcription (STAT) family (STAT1, STAT2, STAT3, STAT4, STAT5a, STAT5b, and STAT6). The activation of STAT has been linked with both the receptor-associated tyrosine kinases, including Janus-activated kinases Src and Abl, as well as the receptor tyrosine kinases, such as EGFR and platelet-derived growth factor receptor (15, 16, 17, 18). Upon tyrosine phosphorylation, STATs form hetero- or homodimers and translocate to the nucleus. Dimerized STAT then binds to a specific promoter-proximal element, thereby activating transcription of target genes (19). STAT3, in particular, has been reported as a proto-oncogene (20) and has been shown to play a role in EGF-induced proliferation in head and neck squamous carcinoma cells (21). STAT3 is activated by EGFR activation (22). However, STAT3 has been shown to play important roles in the differentiation of myeloid leukemia cells (12,23, 24, 25), murine hematopoietic cells (14,26), and rat hepatocytes (27, 28, 29). Its role in epithelial differentiation is unclear. Because reduced expression of K13 (3) is accompanied by reduced activation of STAT3 (11) in HPV-infected papilloma tissue, we have asked whether STAT3 plays a role in the differentiation of human mucosal epithelium. This report provides evidence indicating that activation of STAT3 is required for the induction of K13 during keratinocyte differentiation. Surgical discards of normal laryngeal tissues and HPV-infected laryngeal papillomas were derived from patients. Epithelial explant cultures of normal human laryngeal cells or papilloma cells were established from biopsies in Ham’s F12 with 10 µg/mL hydrocortisone and 10 mL/100 mL Fetal Clone II (Hyclone, Logan, UT, USA), as described previously (30). Normal laryngeal cells were subcultured on mitomycin C-treated J23T3 feeder cells, as described (31). Multiple early passage cultures were used. The use of human tissues and cultured cells was approved by the Institutional Review Board at Long Island Jewish Medical Center. This system mimics the in vivo environment for mucosal epithelium differentiation. The culture system used is a modification of Wakita and Takigawa (32) to induce differentiation of cultured human epidermal cells. Cultured normal epithelium cells were treated with 0.02% EDTA in phosphate-buffered saline to selectively remove J23T3 feeder cells. Normal laryngeal cells were trypsinized and replated in serum-free keratinocyte basal medium (KBM) (Clonetics, San Diego, CA, USA) supplemented with 0.15 mM calcium, 0.5 µg/mL hydrocortisone, 2 µg/mL transferrin, 1 ng/mL EGF, and 5 µg/mL insulin (KGM). After 24 h, cells were trypsinized and suspended in KGM supplemented with 1.4 mM calcium. Cells were cultured at a density of 1 × 105 cells/cm2 on 1% agarose-coated dishes (Nunc) to allow cell-cell contact, with cell-extracellular matrix contact blocked in order to promote differentiation. For control, monolayers of cells were cultured in 0.15 mM calcium KGM on tissue culture plastic at the same density. At indicated times, cells were washed with phosphate-buffer saline and lysates were prepared from harvested cells as described next. Keratins were extracted using the method of Stasiak and others (33), which sequentially extracts the soluble cytoplasmic proteins, the nuclear proteins, and finally the detergent-insoluble keratins. Briefly, cells were lysed on ice with 50 of low salt extract buffer in the presence of complete protease inhibitor cocktail (Roche Molecular Biochemicals, Mannheim, Germany) and phosphatase inhibitors (20 mM α-glycerophosphate, 1 mM sodium orthovanadate, 30 mM sodium fluoride). Lysates were centrifuged at 2000 rpm for 10 min, and the pellets were extracted with 50 µL of high salt extract buffer in the presence of protease and phosphatase inhibitors. The extract was centrifuged at 14000 rpm for 10 min, the pellet was washed twice, and keratin was extracted by boiling for 5 min in 100μL electrophoresis sample buffer. For the determination of STAT3 activation, whole cell extracts were prepared by lysing cells with 1% NP-40, 0.4 M NaCl, 1% glycerol, 1 µM dithiothreitol, and the protease/phosphatase inhibitor as described above. Protein concentrations of the lysates were determined by Micro BCA reagents (Pierce, Rockford, IL, USA). Western blot was performed as previously described (34). Protein (40 µg) was loaded per lane on a 7.5% SDS-PAGE acrylamide gel, and electroblotted onto a nitrocellulose membrane (Shleicher & Shull, Keene, NH, USA). 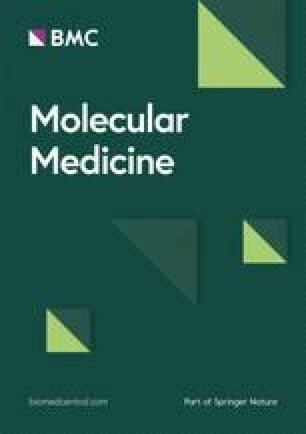 Standard molecular weight marker (Bio-Rad, broad range, Hercules, CA, USA) was used for molecular weight estimation. Blots were stained with Fast green (35) to confirm equivalence in loading and transfer. The immunoreactive species were detected by using Super Signal West Pico chemiluminescent substrates (Pierce, Rockford, IL, USA). After probing with anti-phospho STAT3 or anti-keratin 13, the membrane was stripped, and reprobed with anti-STAT3 or anti-keratin 14, respectively. Signal intensity was quantified by UN-SCAN-IT Program (Silk Scientific Inc, Orem, Utah, USA). pSTAT3C (a gift from Dr James E Darnell, Jr), an expression plasmid that generates constitutively activated STAT3, has been described (22). A hemagglutinin peptide (HA)-tagged dominant negative STAT3 (Y705F) (gift of Dr Jennifer Rubin Grandis) has been previously described (36). Dr Danile Besser donated pTATA-4XM67-Luc and control plasmid pTATA-Luc (37). pHygEGFP was from Clontech (Palo Alto, CA, USA). Anti-PTyr (705) STAT3 and Anti-STAT3 (pan) polyclonal rabbit antibodies were purchased from Cell Signaling Technology (Beverly, MA, USA). Anti-keratin 13 and anti-keratin 14 monoclonal antibodies were from Novocastra Laboratories (Newcastle upon Tyne, UK). Polyclonal rabbit anti-STAT3 and anti-phospho (Tyr-705)-STAT3 were used at 1:500 dilution. Anti-keratin 13 was used at 1:2500 dilution, anti-keratin 14 was used at 1:12500 dilution. Horseradish peroxidase-conjugated secondary antibodies were purchased from Pierce (Rockford, IL, USA). For immunohistochemistry staining, Vectastain Elite ABC Kit (Vector Laboratories, Burlingame, CA, USA) was used. Normal laryngeal and papilloma specimens were fixed in 10% buffered formalin, paraffin-embedded, and processed for histological study by conventional methods. Cultured normal cells were cytospun onto glass slides, followed by immunohistochemistry staining. Five fields were counted per slide with approximately 150 cells/field. The percentage of cells that stained positive for K13 staining in the cytoplasm was determined by microscopic examination. Immunostaining was performed based on previously reported procedure (38). Sections were deparaffinized, submerged in methanol containing 0.3% hydrogen peroxide for 30 min at room temperature to inhibit endogenous peroxidase activity, blocked with 1.5% normal horse serum, and immunostained using the avidin-biotin-complex (ABC) method with diaminobenzidine as label (Vectastain ABC Elite Kit) according to the supplier’s instructions. Antigen retrieval procedure (10 mmol/L heated citrate buffer [pH 6.0] in a microwave oven for 10 min) was performed only for phosphorylated STAT3. The slides were then incubated with the primary antibodies at 1:50 dilution. Sections without the addition of the primary antibodies served as controls. Counterstaining was performed for 30 s with hematoxylin. Normal laryngeal epithelial cells were transfected with various amounts of plasmid cDNA using Lipofectamine Plus reagents (Life Technologies, Rockville, MD, USA) according to manufacturer’s instructions. Twenty-four hours after transfection, cells were transferred to suspension culture, as described above. Using this procedure, approximately 50% of cells are transfected (data not shown). Typically, transfections contained a total of 3 µg of DNA. This included 1 μg of either the STAT3 responsive pTATA-4XM67-Luc or control pTATA-Luc luciferase reporter construct, 0.5 of pHygEGFP expression construct, and 1.5 µg of STAT3C or STAT (Y705F), control empty vectors pcDNA3 (Invitrogen, Carlsbad, CA, USA), or pCAGGS-Neo. Cytosolic lysates were prepared at 0, 24, and 48 h post-suspension, and luciferase assays were performed using a commercial luciferase assay kit (Promega, Madison, WI, USA). Luciferase activity of the lysates was measured using a TD-20/20 luminometer (Turner Designs, Sunnyvale, CA, USA). STAT3-driven luciferase expression was determined by subtracting the background activity obtained with pTATA-Luc transfection after normalizing to green fluorescent protein for transfection efficiency. The final luciferase activity was expressed as a percentage relative to that of the control transfection with pcDNA3 or pCAGGS-Neo at 0 time. The XTT (TOX-2) system (Sigma, St. Louis, MO, USA) is a measurement of metabolic viability. XTT was used to assess cell death resulting from transfecting STAT3 mutant (STAT3C and Y705F) constructs in suspension culture. Cells (2 × 105) from suspension culture were plated in 96-well tissue culture plates at the indicated times. Triplicate experiments were performed. Cells were incubated with XTT and absorbance at 450 nm was measured using a Microplate Reader (Bio Whittaker, Rockland, ME, USA). Keratin 13 is normally found in differentiated cells of the larynx, the esophagus, and some other nonkeratinizing epithelia (5). Immunohistochemistry showed little K13 in the suprabasal layers in papilloma tissue (Figure 1A). In contrast, normal laryngeal tissue showed abundant expression of K13 in the epithelium (see Figure 1B). This was consistent with our previous observations that HPV-induced papillomas displayed abnormal differentiation (3). There was little nuclear staining in papilloma cells (see Figure 1C). However, strong positive staining was observed in all layers of the normal epithelium, using a rabbit polyclonal antibody against phospho-STAT3 (see Figure 1D). Notably, activated STAT3 was localized to the nuclei. However, total STAT3 levels were comparable in the 2 types of tissues (see Figure 1E, 1F). Negative controls omitting the 1st antibody did not result in staining either in papillomas or in normal laryngeal tissue (see Figure 1G, 1H). These results are in accord with our previous studies that reduced STAT3 activation (11) and reduced expression of K13 (3) were observed in HPV-infected cells. Immunolocalization of K13 and phospho-STAT3 in papilloma tissue and human normal laryngeal tissue. Immunohistochemistry staining of formalin-fixed, paraffin-embedded normal laryngeal and papilloma tissues. Tissue sections were incubated with K13 monoclonal antibody (A, B), phospho-STAT3 antibody (C, D), total STAT3 (E, F), or control antibody (G, H). Note the presence of very little K13 in the cytoplasm of papillomas and very little phospho-STAT3 in the nucleus of papillomas. Also note that abundant K13 was detected in the cytoplasm of normal laryngeal tissue, and phospho-STAT3 was detected in the nuclei of almost all layers. Control staining does not show significant staining. Arrow indicates basement membrane. Hematoxylin counterstain. Bar, 24 µm. Cultured normal laryngeal cells and laryngeal papilloma cells were suspended in serum-free medium in the presence of EGF and insulin, under conditions where cell-cell contact was enhanced but cell-matrix contact was blocked, to induced differentiation. Cells that had been cultured in suspension displayed an increased cytoplasm to nucleus ratio with a flattening morphology, indicative of induction of differentiation. After a 48-h culture in suspension (data not shown), 56.9% of normal cells were induced to differentiate as measured by K13 staining. 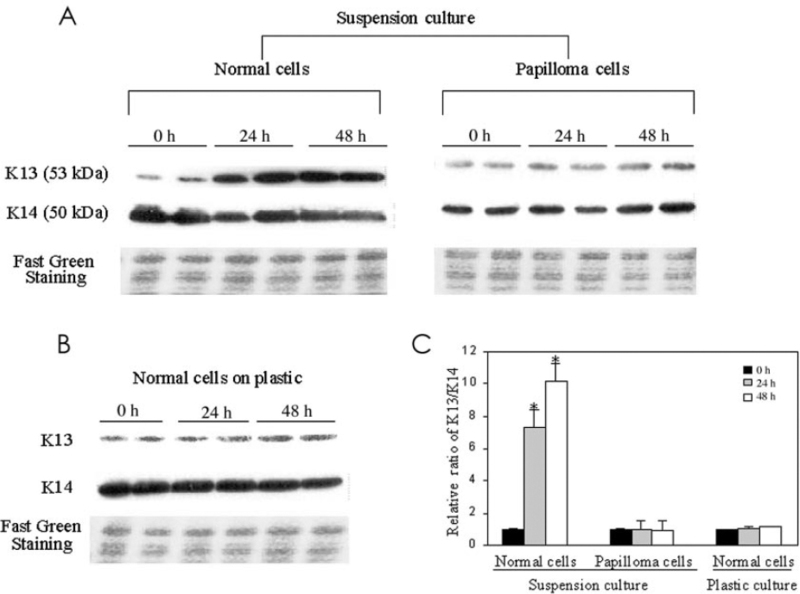 Western blot analysis using a K13 monoclonal antibody detected a 53 kDa polypeptide whose expression was induced at 24 and 48 h in suspension cultures of normal laryngeal cells (Figure 2A). Fast green staining confirmed equal loading of protein. Higher K14 expression is observed in undifferentiated cells (4). Consistent with this, levels of K14 were slightly decreased as normal cells were stimulated to differentiate. Papilloma cells in suspension had minimal induction of K13 and failed to show any reduction in the expression of K14. These observations are consistent with previous in vivo findings (3) and our results in Figure 1. Normal laryngeal cells cultured on plastic (see Figure 2B) did not show alteration in K13 or K14 expression at 24 and 48 h. Earlier studies in our lab (3) had shown that papilloma cells showed markedly reduced expression of K13, but no abnormality in involucrin expression, which seems to be regulated differently from keratins. Moreover, unlike skin, only a subset of mucosal cells expressed filaggrin late in differentiation. Therefore, the ratio of K13/K14 was used throughout the study to quantitate differentiation. The bar graph in Figure 2C shows that suspension culture stimulated normal laryngeal cells to differentiate, with K13/K14 ratios at 24 and 48 h significantly different from that at 0 h (P < 0.01) and no significant difference in cells cultured on plastic (P > 0.05). Taken together, these results support the use of this suspension culture to study differentiation of mucosal epithelium. Suspension culture promotes differentiation of normal laryngeal cells but not HPV-infected papilloma cells. A: Normal or laryngeal papilloma cells were cultured in suspension. At indicated times, cells were harvested and keratin extracts were prepared and analyzed by Western blot, as described in Materials and Methods. Figures are representative of 2 separate experiments. B: Normal cells cultured on plastic. C: Quantitative analysis of K13/K14 expression. Results represent mean ± SD from 2 independent duplicate experiments. The relative K13/K14 ratio was set to 1 at 0 h in each group. The K13/K14 ratio showed that normal laryngeal cells were significantly induced to differentiate at 24 and 48 h by suspension culture (*P < 0.01), whereas papilloma cells in suspension culture and normal cells cultured on plastic were not (P > 0.05). P values were evaluated by Student’s t-test. As a transcription factor, STAT3 has been shown to mediate both growth arrest and differentiation in murine M1 leukemia cells and murine myeloid stem cells (23,39) but stimulate proliferation of head and neck carcinoma cells (21). In order to establish a link between STAT3 activation and epithelial differentiation, normal cells were induced to differentiate and STAT3 activation was assessed by Western blot, using antibodies specific for tyrosinephosphorylated (705) STAT3 or total STAT3 (molecular weight 92 kDa). STAT3 phosphorylation was markedly enhanced after 24 h in suspension culture and remained high at 48 h (Figure 3A), when the K13/K14 ratios were drastically elevated. The elevation in STAT3 phosphorylation was significant (P < 0.01) (see Figure 3B). To confirm that the phosphorylation truly reflected activation, cells were transfected with a STAT3-responsive luciferase reporter construct before suspension. 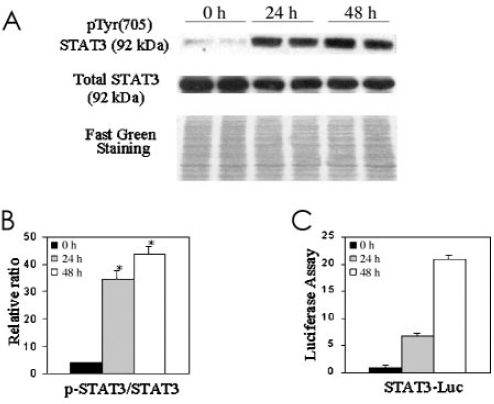 The results depicted in Figure 3C show that luciferase activity was increased at 24 and 48 h, demonstrating increased functional STAT3 transcriptional activity. These results indicate that STAT3 activation accompanies epithelial cell differentiation. These results also are consistent with the in vivo data presented in Figure 1D. Activated STAT3 is enhanced by culturing in suspension. A: 40 of whole cell extracts were analyzed by Western blot, using anti-phospho-STAT3 or anti-STAT3 as indicated in Materials and Methods. B: The ratio of phosphorylated STAT3/total STAT3 after 24 and 48 h in suspension culture showed significant differences from 0 h (*P < 0.01). Data are means ± SD from 2 independent duplicate experiments. C: To confirm that STAT3 phosphorylation was indicative of activity, normal cells were transfected with a STAT3-responsive luciferase construct prior to suspension culture. The data in Figure 3 indicated a correlation between STAT3 activation and differentiation, but did not directly test whether STAT3 activity regulates differentiation. Therefore, we used constitutively active STAT3 (STAT3C) and dominant negative STAT3 (Y705F) to address this question. First, we transfected both constructs into normal laryngeal epithelial cells along with the luciferase reporter construct and 24 h later put the cells into suspension to confirm that the STAT3 constructs would function in these conditions (Figure 4A). STAT3C markedly increased luciferase expression, and Y705F reduced the endogenous activity. We then confirmed that neither construct altered cell viability, using an assay that measures mitochondrial dehydrogenase activity (XTT). 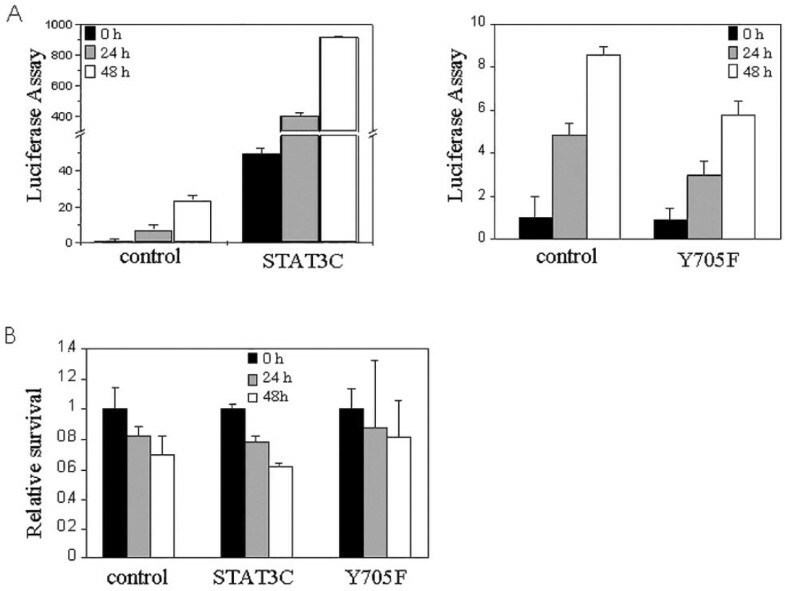 As shown in Figure 4B, neither STAT3C nor STAT3 (Y705F) significantly altered cell viability compared with controls. Dominant-negative and constitutive active STAT3 constructs are functional in suspension cultures. Effects of STAT3C or Y705F expression on STAT3-dependent transcription were measured by luciferase assay. A: STAT3-driven luciferase activity was greatly increased in STAT3C-transfected cells, but not in Y705F-transfected cells. B: Transfection of STAT3 mutant constructs (STAT3C or Y705F) into normal laryngeal cells did not alter survival as measured by the XTT assay. Survival of cells at 0 h in each group was set to 1. Data are means ± SD from triplicate data. To determine the effect of increased STAT3 activity on human epithelial differentiation, normal laryngeal cells were transfected with control vector or with the STAT3C construct. After 24 h, transfected cells were placed in suspension culture, and expression of K13 and K14 was analyzed by Western blot (Figure 5). The K13/K14 ratios were significantly increased in STAT3C-expressing cells compared with the controls (P = 0.02). Expression of the constitutively active construct with a FLAG-tag was confirmed by immunoblotting with an anti-FLAG antibody (data not shown). Our data therefore suggested that activated STAT3 enhanced the expression of K13. STAT3 activation enhances differentiation of normal laryngeal cells. Cells were cultured in suspension 24 h post-transfection. At indicated times, keratin extracts were prepared and analyzed by Western blot. Expression of a constitutively active STAT3 (STAT3C) construct enhanced K13 expression. Fast green staining shows equal loading of protein. 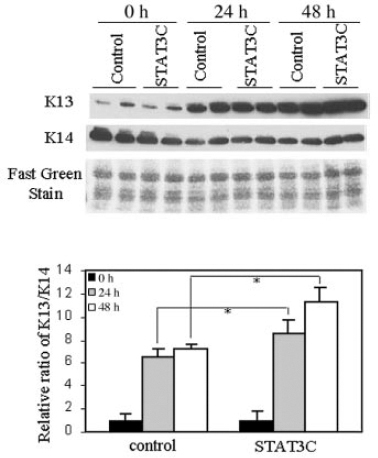 Relative ratio of K13/K14 shows that STAT3C promoted differentiation significantly at 24 and 48 h compared with the control in suspension culture (*P = 0.02). Data are means ± SD from 2 independent duplicate experiments. To assess the effect of a decreased STAT3 activity on epithelial differentiation, normal laryngeal cells were transfected with pCAGGS-Neo control vector, or with a dominant negative STAT3 (Y705F) construct. Cells were put into suspension 24 h later. Keratins were then analyzed by Western blot at indicated times (Figure 6). The ratio of K13/K14 in STAT3 (Y705F)-expressing cells was markedly inhibited after 24 and 48 h in suspension culture compared with the control group (P = 0.02). Expression of dominant negative STAT3 construct with a HA-tag was confirmed by immunoblotting with an anti-HA antibody (data not shown). These results demonstrated that tyrosine phosphorylated STAT3 is required for the differentiation of normal laryngeal cells. 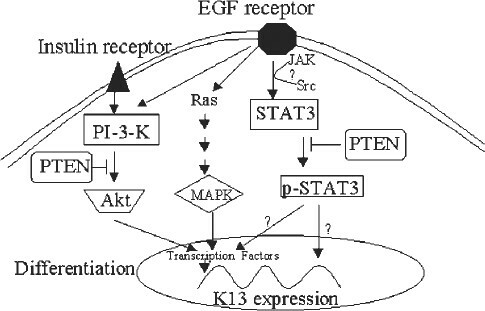 The proposed model shows STAT3, in combination with the Akt and MAP kinase pathways, regulates K13 expression either directly, indirectly, or both in the laryngeal epithelial cells (Figure 7). STAT3 activity is required for differentiation. Cells were cultured in suspension 24 h post-transfection. At indicated times, keratin extracts were prepared and analyzed by Western blot. Expression of a dominantnegative STAT3 (Y705F) construct inhibited K13 expression. Fast green staining shows equal loading of protein. 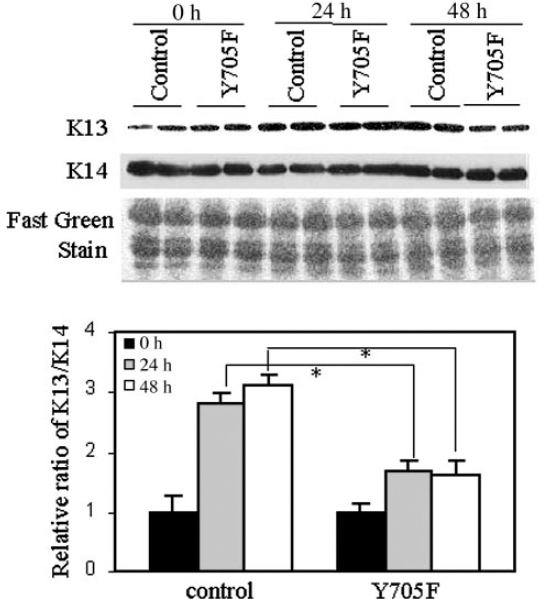 Relative ratio of K13/K14 shows that STAT3 (Y705F) significantly inhibited differentiation compared with the control (*P = 0.02). Data are means ± SD from 2 independent duplicate experiments. Proposed model for STAT3-mediated laryngeal epithelial cell differentiation. The model shows that STAT3, in combination with the Akt and MAP kinase pathways, regulates K13 expression either directly, indirectly or both. The extrinsic cues that determine cell proliferation compared with cell death compared with cell differentiation depend on ligand-induced, receptor-mediated signals, including cell-cell and cellmatrix interactions. The biologic effects of receptor-mediated, growth factor-induced signaling may differ between suprabasal and basal keratinocyte cell layers, since proliferation of normal stratified squamous epithelium is stimulated only in the presence of cell-extracellular matrix interaction (40). In this report, we have shown that normal laryngeal cell differentiation was induced by suspension culture, by which cell-extracellular matrix interaction was blocked while cell-cell interaction was maintained. In contrast, laryngeal papilloma cells failed to differentiate in suspension culture. Thus, this culture condition reproduced the in vivo differentiation phenotype of normal cells and papillomas, at least in part. STAT3 activation has been shown to correlate with differentiation of primary mouse skin keratinocytes (41). According to that report, STAT3 is activated in keratinocytes, which are in a stage of growth arrest and differentiation. Consistent with this, our investigation showed that STAT3 becomes activated during human keratinocyte differentiation. Dominant-negative STAT mutants have been used to test whether STAT activation is required for survival of squamous cell carcinoma of head and neck (21) and cytokine-induced differentiation of myeloid leukemia M1 cells (12) and bone marrow cells (13). In our studies, transfection of a dominant negative STAT3 (Y705F) into the normal laryngeal cells inhibited the expression of differentiation-specific K13. Additionally, transfection of a constitutively active STAT3 into normal laryngeal cells increased the expression of K13. To our knowledge, this is the 1st report demonstrating that activation of STAT3 regulates differentiation of normal human stratified squamous epithelium. The effect of STAT3-mediated promotion of differentiation could be direct or indirect, or both. Several transcription factors are known to regulate transcription of differentiation-specific genes. For example, Skn-1a and Skn-1i activate transcription of the keratin 10 promoter, whereas Tst-1/Oct-6 transcription represses keratins 5 and 14 (42,43). Sp1 and AP2 transcription factors also were shown to be important for the up-regulation of keratin genes during differentiation (44,45). Potential STAT3 binding sites (18) at −123 to −113 and at −51 to −340 are located in the K13 promoter region (46). Moreover, a reverse complementary site is found at −271 to −260. We believe that these sequences may confer STAT3 binding and subsequent transactivation of the K13 promoter. C-Myc and transforming growth factor β-induced transcription factors are well documented to function as molecular switches that convert the cellular program from proliferation to differentiation in other cell types (47,48). In this regard, it is conceivable that STAT3 may act as a program converter during laryngeal epithelial cell differentiation. Human papillomavirus (HPV) types 6 or 11 causes benign tumors of mucosal epithelium. These tumors are characterized by slow proliferative rates, abnormal terminal differentiation (3), and a low probability of malignant conversion. We previously reported that HPV 6/11-infected tissues show increased expression of the EGFR in both basal and suprabasal cells (9). We also documented reduction in the activation of both Akt and STAT3, due to increased expression of PTEN, a dual specificity phosphatase, in HPV-infected papillomas (10,11). Judging from our immunohistochemical findings (Figure 1), nuclear phospho-STAT3 was abundant in the upper layer of normal laryngeal epithelium where keratinocytes had differentiated. In contrast, there was little phospho-STAT3 in HPV-infected laryngeal papillomas where abnormal differentiation was observed, consistent with the notion that STAT3 regulates keratinocyte differentiation. Data obtained by expressing mutant STAT3 imply that reduced STAT3 activation, due to overexpression of PTEN, may contribute to the differentiation defect in HPV-infected papillomas. Apart from the STAT3 pathway, we are currently investigating potential roles of the MAP kinase and PI-3-kinase/Akt pathways in the regulation of differentiation of normal mucosal epithelial cells, since both are altered in papillomas. Interestingly, our preliminary data indicate that both these 2 signaling pathways also appear to contribute to normal laryngeal cell differentiation (Dackour and others, personal communication). A model of this interaction is shown in Figure 7. If this model is correct, it may prove necessary to restore both AKT and STAT3 to induce papilloma cell differentiation. These studies are continuing. In summary, the studies reported here have demonstrated that STAT3 activation is required for keratinocyte differentiation in normal human stratified squamous epithelium. The suspension culture mimics the in vivo differentiation of normal laryngeal cells and HPV-infected papilloma cells and can be used as a model system for studying regulatory mechanisms of differentiation in human stratified squamous epithelium. Furthermore, our findings may prove useful in developing a STAT3-targeting strategy to enhance differentiation in HPV-infected laryngeal epithelial cells, thereby providing a potential alternative treatment for this disease. This work was supported by grant P50DC00203 from the National Institute on Deafness and Other Communication Disorders and a Faculty Research Award from the North Shore-Long Island Jewish Research Institute. We thank Dr Jennifer Grandis and Dr James Darnell who provided the dominant-negative STAT3 and the constitutively active STAT3. We express our gratitude to Dr Danile Besser who provided the STAT3 luciferase reporter and control constructs. Also, we thank Dr Allan Abramson and Dr Mark Shikowitz who provided normal and papilloma tissues, and May Nouri who provided normal laryngeal cell cultures.